Please see the forum thread for full usage notes. 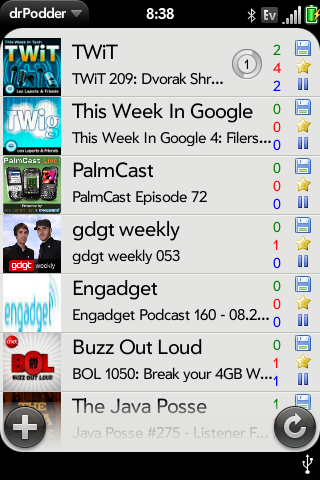 I am writing drPodder because I need a good podcatcher that does what I want it to do. Even the professional Windows Mobile solutions I've used in the past disappointed me, so I decided to start early and make it like I like it. drPodder is still beta, but as a developer, bugs bug me, so when my code isn't working correctly, I'll try to fix it as soon as I can. License: drPodder is Open Source software licensed under GPLv3, and the code is hosted at webos-internals. Feel free to poke around and see how it works and learn more about webOS development yourself.